Is there a cut cutscene where the gang discovers or is told Arthur has TB? They all seem to automatically know once you get to Beaver Hollow. But they know before Arthur tells her. They appear in camp a few missions before. How do you get them to appear before "My Last Boy"? In both of my playthroughs they didn't appear until then. Not sure the mission order I played the first time, but this last time the final mission I played before that was "Mrs. Sadie Adler, Widow." Do they not spawn until "My Last Boy" if you play it in a different order? I was logging into online and one of the screenshots showed a man scowling with a rifle draped over his arm. In the background there were Chinese railroad workers working on the railroad. I don't think this appears in-game. I found that quite distracting. The Edith Downes side missions can be done before you meet her in Annesberg. Maybe these were main missions as it ties into the story and you can do the side missions before meeting her in Annesberg for the first time during the Murfree Country mission which makes no sense. Maybe it unlocked AFTER this mission? At the current situation it makes no sense. Also Thomas Downes grave is written "Thomas Downs" so maybe that was his beta name. Might just be an error but it could also point to something. I noticed in the "Gang Savings" section of the journal, a couple of jobs don't list all of the people who participated in them. Off the top of my head, "Banking, The Old American Art" doesn't list Lenny, "My Last Boy" doesn't list John or Javier, and "Our Best Selves" doesn't list John. Once again, could just be errors. 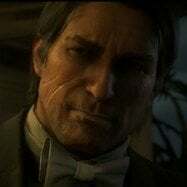 I thought for a bit it listed people who only got cuts, but Hosea is still included in "Banking" despite his death and Charles is listed in "My Last Boy" despite outright saying he doesn't want his cut. Once again, it's possibly just errors (maybe done on purpose to simulate real mistakes?) but it could point to different people participating in the jobs at some point. The Central Union Railroad has Chinese workers I think. There's a couple of events with the foreman there. The mission "Enter, pursued by memory" originally had a section where Arthur and Javier fight off wolves in a cave. A LOT of content was cut from the game according to Gabriel Sloyer. Do you have the original source for that? Would be nice to see what else the VAs have to say. Any thoughts on this shot from the trailer? It's presumedly the gravesite of Eliza and Isaac. It doesn't appear in the game but must have been a mission or cut scene at some point. You can't really see Arthur's face, so it's hard to tell if maybe this was supposed to be a flashback (when Arthur was younger) or just him visiting the gravesite. Anyone recognise the location? Could it be on the map somewhere? 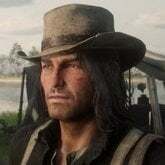 Anyone know if the bandanas or any other outfit is hidden for Arthur and CAN be added to the clothing list like GTA V? ESPECIALLY on Last gen where shirts for Franklin's jacket were hidden unless you manually unlocked via save editor or buying the current gen version. I noticed this when I was replaying the mission "Old Friends." After you catch Kieran, if you check the map you'll see six ally markers back at camp, one for each of the guys who actually helped you out, as well as one for Hosea, even though he didn't actually participate and was barely even in the mission. This makes me think that he might have been originally slated to help out during this part, but for some reason his participation was cut. 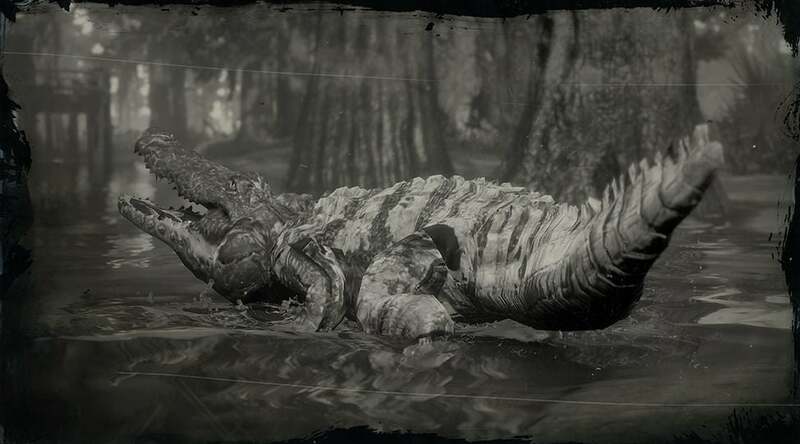 I'm guessing that in the beta, the Legendary Alligator had a striped black-and-white pattern rather than a plain white one. This gator or one damn near close to it is in RDO. Looks like I'm gonna have to go Online (which is full of griefers) just to check it out. why is there so many posts recently of people talking about single player things? Aight someone try to recreate this. I somehow managed to wear a bandana and that skull mask from the fence at the same time. (pre any patch) when I got to camp Arthur only took off the bandana and I was walking around with only the mask. The gang was commenting as if I was wearing a bandana. Here is some dialogue I remember - Jack "I have a bandana like that in my tent" Micah (after I antagonised him) "what I cant hear you with that thing covering your face" Abigale "take that mask off before you scare Jack"
Where is the Criard Slaughterhouse? Is it even still in the game? On the old map it was in southwest Saint Denis. isnt this a thread strictly for online beta talk? No. This is for Red Dead Redemption 2 and Red Dead Online's beta elements. Red Dead Online is only called a beta so Rockstar can avoid criticism for it being a lackluster piece of sh*t.
It's NOT a beta. That's just marketing BS. If its a beta, why are gold bars purchasable? And Online ISN'T extra gravy, it's a part of the game WE PAID for that they withheld to get better reviews. Now this whole section is for single player bar this thread where we discuss changed elements for the ENTIRE game including Online. Otherwise go to the Online section to discuss Red Dead Online. its still a beta. not really complicated. majority of the story missions arent even out. tons of content isnt even out yet either. they have said multiple times its only a % of whats coming. and yes when they put out one of the best SP games ever, it is extra gravy. a lot of extra hours. god of war for example 25 hours and done. rd2 SP can easiy get 100-150 and the online is extra gravy. as they already said now that SP is done the full team can now all work 1000% in the online, its only a small percent of what will be coming. With that amazing SP obviously not everyone could work to the online. 99% of recent games that are mainly online have no SP at all, or garbage SP...and other good SP games lately like gow for example have NO online.